It has been nearly 6 years since I graduated from FES, nearly 5 since I helped out with my last EFFY. When I think back on my time at Yale, stories from EFFY nearly always bubble up to the surface first. Stories from EFFY are what I tell at parties. They’re what I tell at job interviews. On first dates. Sometimes the time working on EFFY felt long, laborious, mundane. Never-ending logistics, a constant stream of emails and text messages, more bad movies than I could ever count. There were spikes of excitement and surprise - unexpected celebrity audience members, a sold-out opening night, winning the Kroon Cup, being recognized by the Dean. And there were spikes of frustration and sadness - speakers who cancelled at the last minute, showing a film that audiences did not love, having to watch a much-loved teammate battle breast cancer. Now all of these moments make me feel contented. I remember a night eating Indian delivery with the team during a late-night film-watching marathon and a looming decision deadline. We felt like we’d done nothing but watch bad documentary after bad documentary, and we knew that we had to make the call on what films would make it to our final lineup. Everyone was tired. Everyone was cranky. Frustrated. The room was split on the last few films that were up for consideration. We watched them again. We argued again. And then - I spilled curry all down my sweater. All over. Sweater ruined forever. And that broke the tension. We laughed. It was so late at night, and we felt like the work had only just begun. But the strong opinions relented, we wrote up our list of final selections, and walked home in the cold early-morning. And I smile to remember that night. In the year after I graduated, I was working at FES and the EFFY Leadership team took me on as a “special advisor.” They gave me a night of the festival to program and oversee, and that night remains perhaps one of my most treasured EFFY moments. That night just happened to overlap the visits of three different filmmakers in town for their films’ screenings. Then-Dean Peter Crane was our panel moderator (he simply loved EFFY), and the panel included two incredible, distinguished Yale professors. A fantastic group of volunteers and EFFY team members had come out to help run the logistics of the night and, after the events were over, it was the custom to take the panel, visiting filmmakers, and volunteers out to dinner. I was overwhelmed with gratitude in how well the night had gone, so we opted for a huge feast at a local Indian restaurant. And just looking up and down our huge table, eating spicy food late at night, talking about all the wonderful projects our guests were working on, all the questions our students had, the giant smile on our Dean’s face - I knew we had created something truly amazing. And now it’s the 10th year of this Festival. It has continued to grow and become even more amazing. The little green EFFY monster, a creation that our team discussed in circles during the festival’s third year (would he damage the professionalism of our festival? Would he inject a feeling of fun and whimsy into our marketing? Would people be confused by him?) now wanders the halls of Kroon during April - alive and fully life-sized. 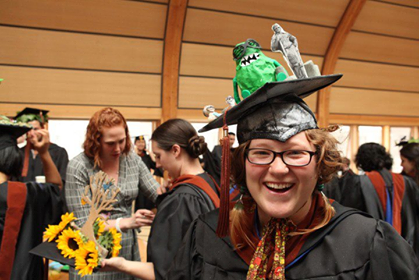 I wore the EFFY monster on my graduation cap in 2012, a testament to how central he and the festival were to my experience at FES. I feel honored to have been part of something so wonderful as EFFY, and it makes my heart sing knowing that it did not die, as so many student efforts can when their champions graduate and move on, but rather it has become even bigger and better than what I ever imagined it could be. So congrats on your 10th birthday, EFFY. Here’s to 10, 20, 30 more!